Finch Main Gardens is the shopping plaza located at 2437 Finch Avenue West. It was built in 1962. The plaza was originally intended to be a medical centre but swiftly expanded into a full-fledged commercial development, including a Loblaws grocery store. In the basement of the main building, a billiards hall opened that was owned and operated by Frank Romanelli. He installed five full-sized 6’ by 12’, custom-made Brunswick snooker tables. The tables had fashionable styling and were assembled on-site, piece-by-piece. The tables exist in perfect form to this day. Currently the pool hall is branded as AR Billiard Time Ltd. and is operated by Issac (Amir). During the 1960’s, Frank Romanelli also ran another auxiliary local pool hall in the Woodview Park Plaza located on the east side of Weston Road, at Bradstock. Frank’s son John was fascinated with the pastime as he watched endlessly in awe at the various matches of snooker before he attempted to develop his own mastery of the game. The billiards hall served as a gathering spot for area boys. At Finch Main Gardens in the 1960’s, several area youngsters began to develop their own artistry of the game, including Dave Richardson, Paul Richardson, Sam McCulloch and Dave Schule. 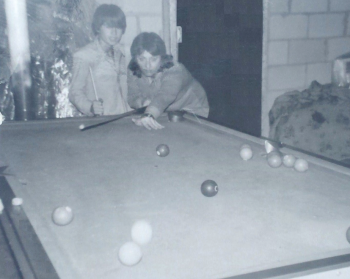 While young John Romanelli continued to develop his own proficient techniques, some other area youth began their own quest for billiard excellence in the 1980’s. One was Mario Celenza. Celenza grew up in the Woodview area along Verobeach Boulevard. He is a son of Abruzzi, Italy natives Remo and Concetta Celenza. Remo Celenza worked in the construction trade and operated a dump truck. 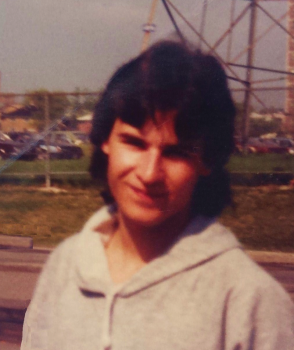 Young Mario played ice hockey for the Humberview hockey club at nearby Habitant arena. His older brother Renato was known in the community as being a tough guy, perhaps even the gristliest. As long as recreational sporting events didn’t interfere, Mario Celenza would practice his hobby every day from 8 a.m. until midnight. In 1988, he finished fifth in the World Snooker – Under 16 competition held in Scarborough, Ontario. In his final match, he lost to the eventual overall winner, Vince. Celenza became known as a pool shark and was accepted for his ability and expertise in the game. Celenza continued to develop his artistry and skill in pool hall amusement games like poker pool, golf and snooker. So much so, that his skill level and spirited reputation became well known outside the community. At this time, a fringing challenger unexpectedly appeared in our community for a show-down. He called himself “Frank” and challenged Celenza to a game of snooker. During the entire match, Frank kept his long trench coat on. He taught Celenza a lesson that day as Frank appeared to be completely unbeatable. 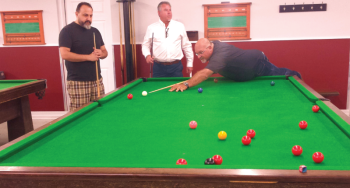 At Finch Main Gardens billiard hall, area players like Mark Waddell, Sid Korman and Jim Bagshaw had their nights and shared triumph with their own local limelight and success. At the time, both Carlo Celenza and Mike Dewey were recognized as respectable competitors. Jimmy ran the billiards hall and constantly bragged of celebrated successes by Romanelli who beat world class players like Cliff Thornburn, at one time or another. Gideon Goldschlager operated an amusement and billiards room at Finch and Weston Road in the Finch West Mall. Yet, another pool hall had earlier been quite fashionable right across the street. Three Musketeers Billiards Hall operated there on the west side of Weston Road and south of Finch. It was a well-known location for the development of skilled players. Goldschlager began to stage outside matches for Celenza with gaming incentives in pool halls across Ontario. The stakes climbed higher, reaching levels of $1,500 or $3,000 per game. Collecting winnings in these matches were occasionally challenged by competitors, and older brother Renato needed to be called upon to help collect the winnings. But the mere presence of Renato, who actually had community friendly appeal, was sufficient enough to complete business. Players like Russell Fitchett became well known and acquired the title of being a local pool shark. A pinnacle to the cluttered and chaotic world of pool sharks had been formed in Emery. These days, with his pool sharking days behind him, Mario Celenza works in account management in tools for trade. He sometimes likes to reminisce and picks up a cue, reminding him of those tough shots where stakes were riding high and the atmosphere of peril lingered ever so gracefully in the air. Nerves, patience and geometric skill are all it takes to become one of the best. So if you’re feeling a little forsaken, come on down to the AR Billiards Hall at the B & T Plaza sometime and re-examine your lost skill. The plaza is currently undergoing a bit of a make-over. You can contemplate just how close you could have been at being one of the best.